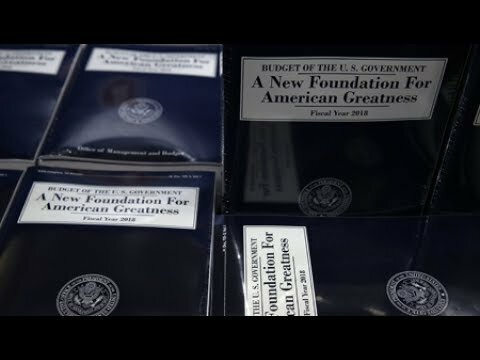 Dean Baker of the Center for Economic and Policy Research says President Donald Trump's new budget makes unprecedented cuts to already subpar levels of social assistance and "redistributes upward" to wealthy Americans. AARON MATE:	It’s The Real News. I’m Aaron Mate. The White House has unveiled a budget proposal that slashes the safety net for tens of millions of people. It’s called A New Foundation for American Greatness. Its main targets are programs for low-income Americans including well over $1 trillion in cuts to Medicaid and welfare and tens of billions for disability benefits and student loans. Meanwhile, the budget proposes what it calls the biggest ever tax cut and a 10% increase in military spending. On Capitol Hill, Senator Bernie Sanders denounced Trump’s proposal. BERNIE SANDERS:	This is a budget which will make it harder for our children to get a decent education, harder for working families to get the healthcare they desperately need, harder for families to put food on the table, harder to protect our environment, and harder for the elderly to live out their retirement years in dignity. This is a budget that is immoral, that will cause an enormous amount of pain for the most vulnerable people in our nation. Joining me is Dean Baker, co-director of the Center for Economic and Policy Research. Dean, welcome. AARON MATE:	Give us your assessment of this bill. It’s said to be the biggest cut to programs for low-income Americans since Ronald Reagan. DEAN BAKER:	I’d have to look closer, but my guess is it’s probably bigger than the cuts the Ronald Reagan had for low-income programs. It’s important to keep in mind, not all this is targeting low income. He does disproportionately hit low income, but the better or worse, there’s not that much money that we give to low-income people now. So a lot of the cuts here aren’t really directed at low-income people. Again, I’m not trivializing the impact on low-income people, it is bad. But, for example, his very big cuts to Medicaid. Roughly a quarter of Medicaid spending is for seniors, many of whom aren’t low income or at least weren’t low-income during their working lifetime. Many of these are seniors that are in nursing home facilities, and they spent through their assets, and they now qualify for Medicaid. So that’s a very, very big hit. Also in here, there is huge cuts to the domestic discretionary portion of the budget. This is most of what we think of as the Federal Government: the National Parks, the National Endowment for the Arts, humanities, NIH, the National Institutes of Health. He’s projecting cuts over the course of a decade of about 50% for those programs. That’s an enormous cutback on the size of those programs. Also, very big hits for federal employees. He’s proposing large cuts to their pay, to their retirement benefits, and I’ll have to double-check this, but I believe he’s even proposing to cut pensions for people who are already retired. This is money that they worked for, and he’s going to take it away from them. If Mr. Mulvaney wants to look at theft, these people worked for those pensions, and their budget proposes to take it away from them. AARON MATE:	The budget also includes a forecast of economic growth of 3%, and the thinking there is that that will help pay for the massive spending increases to the military and not keep the federal debt from growing even bigger. Is that a fair assessment, and can you explain what the administration is doing here with the numbers? DEAN BAKER:	Yeah. What they’ve assumed is very high growth. I’ll give you a point of reference to that in a second. Basically, what they’re assuming is that that growth will cover their tax cuts. Of course, they intend to have very large tax cuts targeted primarily for the wealthy. We already had those outlined, but they don’t fully lay them out yet in this budget. They’re saying that they’re going to get the same amount of tax revenue as was projected in the baseline even though they’re going to have much lower tax rates generally for the wealthy. That will be because they’re projecting this much more rapid growth. They’re projecting 3% average annual growth. The projections that we have from the Congressional Budget Office are on the order 1.8%, so that’s a very, very large increase, which basically is just hand waving. There’s literally no reason to think that will happen. We have a lot of research on this topic done by economists across the political spectrum. None of them has any story whereby the tax cuts he’s talking about could lead to anything remotely like that sort of growth. We actually did this experiment. You don’t typically get to experiment with the U.S. economy, but they had the opportunity to experiment with the U.S. economy both under President Reagan in the ’80s and then under President George W. Bush in the last decade. We saw there was no visible upticked growth. Arguably, it fell. But in any case, the story that somehow we’re going to see this huge increase in growth, because that really is a lot if you’re going from 1.8% in the baseline to 3% annual growth because of your tax cut, that’s an enormous increase. Basically, it’s just making stuff up. It’s not serious. AARON MATE:	Okay. Then, what are the actually consequences of that? Because if ultimately this forecast proves to be untrue, that means, I imagine, that more programs have to be cut down the line. So is there a historical precedent or example for what happens when these predictions fall so woefully short? DEAN BAKER:	We will see much larger budget deficits. They’re actually projecting a balanced budget come 2027, the end of the period. We won’t see that. We will see larger budget deficits, and then the question is, how do you respond to that when we had the budget deficits build up in the Reagan years? That was subsequently used for the basis for cuts to other areas, particularly in the Bush years and then under President Clinton. In the Bush presidency, we did get large deficits. There wasn’t that much by way of cuts. Of course, we had the economic collapse in 2008. That wasn’t due to the budget deficits, but we had the economic collapse, and then we had increased spending because we needed stimulus. So it’s hard to say if you were to follow this path, and we saw large deficits arise, what would be the response. AARON MATE:	Dean, you wrote a book recently called Rigged: How Globalization and the Rules of the Modern Economy Were Structured to Make the Rich Richer. Your research goes through all the areas of policies, especially wages, where deliberate decisions limit the economic power and well-being of ordinary people. Can you place this budget in that context? DEAN BAKER:	Sure. This is an effort to redistribute upward, and both in the sense it’s cutting a lot of programs that low to middle income people depend on, the tax cuts are oriented towards the wealthy, but there’s also regulatory issues that very, very much benefit the financial sector. For example, they very much want to rein in the Consumer Financial Protection Bureau. You go, “Why would you want to do that?” Basically, the cop’s on the beat to make sure that the financial industry isn’t able to rip people off. Well, they want the financial industry to be able to rip people off. That’s money out of your and my pocket into the pockets of rich people on Wall Street. So this is about taking money from the rest of us and giving it to those who are already very rich. AARON MATE:	The cuts to programs like food stamps and people with disabilities, can you talk about what they would face if these cuts go through? DEAN BAKER:	People are getting food stamps, this is not a lot of money. The average benefit, I’d have to double-check, I believe it’s around somewhere $150 a month, so it’s not like the people are living high on the hog based on their food stamp benefit. If they didn’t get that, these are people who already are scrimping to make ends meet, so more people will be evicted, more people will have days they go without food or their kids will go without food. This is really miserly stuff. In terms of the healthcare, we know people won’t get healthcare insurance, and that means they won’t be treated for conditions that are treatable. They’ll get worse. People will die. It’s a pretty dismal story. We’d been making progress. No one was thrilled with the Affordable Care Act, it could’ve been more generous, could’ve been done different ways, could’ve been done better, but that extended coverage to a lot of people who didn’t previously have it, and that was showing up. There already was research showing that that had a visible effect on a lot of people’s health. This is taking us 180 degrees in the opposite direction. DEAN BAKER:	We structure our whole economy in ways that create winners and losers. That’s the point of my book and a lot of my writings. The people who are big winners, that’s because we structured it that way. I was at the Fed yesterday, and we were talking about the Fed raising interest rates. You raise interest rates, that keeps people from getting jobs, so they’re not getting jobs. Some number of people won’t get jobs because the Fed raised interest rates. I understand, they’re raising interest rates because they’re worried about inflation. That’s fine, but that’s keeping people from getting jobs. So we give some of those people food stamps, we give some of those people Medicaid, you want to call that larceny? They weren’t at the fed, they weren’t the ones who said that they’re going to raise interest rates to keep people from getting jobs. So I can give a long list of things. Of course, I do in the book. I’m not pitching a book. It’s free, so you can download it for free. But there’s a long list of ways in which we’d redistributed income upwards, and I might call much of that larceny. But in any case, that’s the way we structure the economy, so having some safety net programs that ensure that the people who we’ve made to be losers in this system don’t starve, get access to healthcare, that doesn’t seem like larceny to me. AARON MATE:	Dean, the approach in this budget seems to mirror that of the Republican healthcare plan in the sense of it shifts so much of the burden onto states in how they distribute social assistance. Can you talk about the impact of that? DEAN BAKER:	This is kind of a old trick in Washington because you have politicians here that want to cut programs for low- and middle-income people. They don’t want to take the political heat for it, so what they do is they go, “We’re going to give you a pile of money” to the states, and they say, “You figure it out.” This is certainly what Reagan did, and this is clearly the strategy with Medicaid. They are talking about with TANF, I haven’t fully seen what exactly the proposal’s going to be with TANF, but in any case, they’re talking about giving basically block grants of money to the state and say, “You figure out to deal with it.” You’re going to then force governors, many of whom are now Republicans, they’re not anxious for this, to tell people in their state, “Yeah, we did used to pay for your nursing home coverage, now we aren’t going to, so your parents are going to be thrown out of their nursing home.” They’re going to hand that to the states and let the states deal with it. AARON MATE:	Finally, Dean, the politics of this measure. I’ve seen even a member of the Freedom Caucus say that this budget proposal might even go too far, which is telling coming from such an extreme wing of the Republican Party. But even if this passes the House, it likely faces an uphill or impossible road in the Senate. What do you think will actually happen? Is the administration setting the goal post so far to the right that they eventually seek a so-called compromise that still is draconian? DEAN BAKER:	That’s the real concern. This will not pass as the budget. That’s pretty much inconceivable. Part of the story is if the Trump administration were serious about this passing as the budget, he wouldn’t be doing it when he’s out of the country. He’d be there at the podium saying “Here’s my budget. I’m really proud of it.” He’s not doing that because he’s not going to stand behind it, but he does make more draconian measures acceptable. So this is essentially a base, it’s a pull on the debate. The idea, I’m sure their intention is, “We’re going to move the overall debate right, so no, we’re not going to cut Medicaid by a third. We’ll cut it by a fifth. See how much better off you are.” So it’s trying to make something that’s, in fact, a very extreme position acceptable. AARON MATE:	Dean, that’s a great point. If I recall right with previous budgets, when they get unveiled, the President hits the road to promote them. In this case, Trump is overseas in the Middle East. DEAN BAKER:	Yeah. You sort of wonder whether he even knows that it’s being released. I’m assuming he does, but he clearly does not … His administration has made a decision. He’s not out front center as the person pushing this budget. AARON MATE:	Dean Baker, co-director for the Center for Economic and Policy Research, we thank you for sharing your take with us. AARON MATE:	And thanks for joining us on The Real News.